On this website you will find some fun games in which Bride-to-be's involvement would be also necessary. Bridal Shower honey Do's is one such game that will be enjoyed by Bride-to-be and the guests. How to Play: Distribute the printed Honey Do Game cards among Bridal Shower party guests and also give one card to the bride. Different chores are mentioned in this game, the guests will guess whom the bride to be will assign a certain chore and tick in front of that chore under the section either bride or groom. At the end of the game match the bride-to-be's assigned chores with answers of the guests. The guest with most correct answers will be the winner. 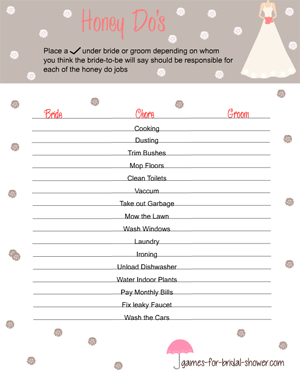 Click on the game's thumbnail image shared above to save the free printable Honey Do's game card for bridal shower. Not only this game is very interesting, also I have decorated in such a way that your guests and bride-to-be will thoroughly enjoy playing this game. Click on the small image above to get this adorable Honey Do's game printable in lilac color. It is decorated with adorable image of a bride and lots of flowers. Print this game if lilac matches your Bridal Shower theme. Here is a black and white image of this Honey Do's Bridal Shower Game. You can print it using any black and white printer that you have at your home.